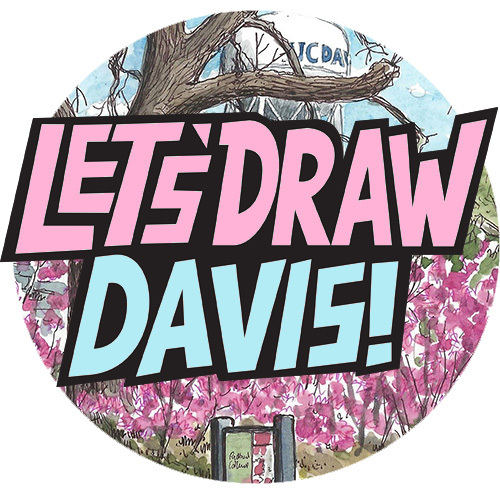 Now the sun is back out, it’s time for another sketchcrawl in Davis! Let’s meet at 10:30am outside the Dresbach Hunt Boyer Mansion on the corner of E and 2nd Streets. There’s a little area with some seats which is nice. I will be creating maps showing where many of the 100-year-or-older spots are in Davis, and then you’re on your own to draw and explore. If you have a bike you can go even further afield, such as the old 1908 buildings on the UCD campus, but many old sites are within a short walk of each other in the old downtown area.We will then reconvene at 3:30pm back outside the Dresbach Hunt Boyer Mansion to show each other what we have done, and see how much of old Davis we have caught on paper. Ads always this sketchcrawl is FREE and open to ANYONE who likes to sketch. You may be a beginner wanting to learn from sketching with others, or an old hand who just needs to get out and draw stuff, you can sketch alone or in groups, you can stay from start to finish or just come along and do one sketch and that’s that, it’s totally up to you. this is an excuse to draw, and excuse to look around our town (I mean, our City), and learn a bit of history through your sketchbook.